Primary Outflows: Intermediate River between Hanley and Intermediate Lakes. Hanley Lake is a small, narrow lake situated in the middle of the Elk River Chain of Lakes, which is a chain of 14 interconnected lakes draining into East Grand Traverse Bay. It is connected to Ben–Way Lake upstream via the Green River and its major outlet on the south end drains to Intermediate Lake. Like other long, slender lakes in the Upper Chain, Hanley’s deepest spot (27 feet) is near its outlet. This is most likely because the ‘upstream’ ends of the lakes have gradually filled in with sediment from the connecting inlet rivers. Hanley Lake is unique among the Chain of Lakes in that its flushing rate (the amount of time it takes to move the entire volume of water through the lake) is only 5 days, which is the fastest among all lakes in the Chain. This is amazing, because the volume of water in Hanley Lake at any given time is 322 million gallons. In comparison, it takes 173 days to flush all the water through Intermediate Lake, and 6.9 years for Torch Lake. 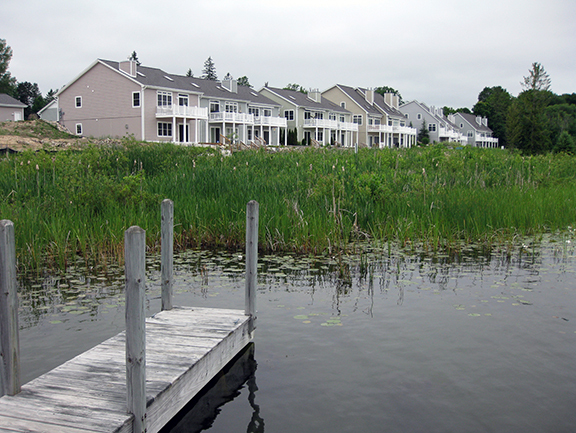 The village of Central Lake is located at the south end of the lake near the outlet. The closest public access point is in the village of Central Lake, which is located on the north end of Intermediate Lake. Are you an angler? These species of fish have been identified during Michigan Department of Natural Resources surveys of the lake: muskellunge; northern pike; rock bass; yellow perch; black crappie; bluegill; largemouth bass; longear sunfish; black, yellow, and brown bullhead; blackchin and common shiners; bluntnose minnow; johnny darter; longnose gar; white sucker; and walleye. Hanley Lake is monitored every three years through the Watershed Council’s Comprehensive Water Quality Monitoring (CWQM) Program for dissolved oxygen, specific conductivity, pH, nitrate-nitrogen, total nitrogen, total phosphorus, and chloride levels. 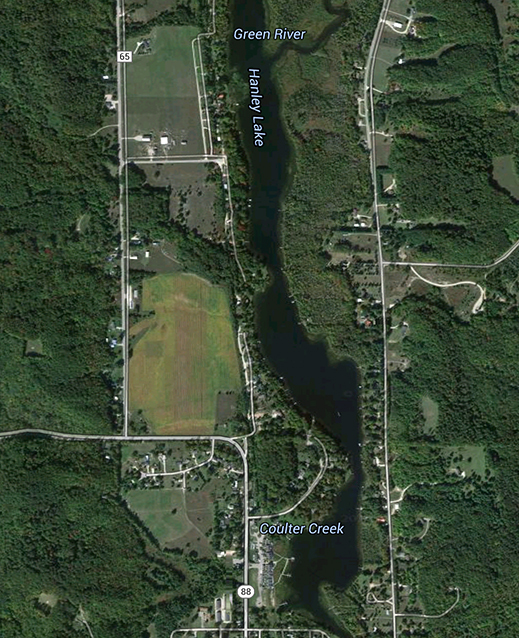 It is NOT currently monitored through the Watershed Council’s Volunteer Lake Monitoring (VLM) Program. If you are interested in becoming a volunteer, contact the Watershed Council at 231-347-1181.